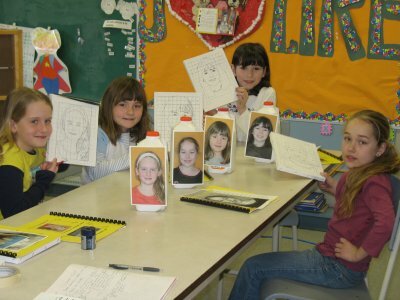 Each student created a self-portrait on an 8 X 10 canvas and wrote a journal of this activity. Outcomes included in this project are Language Arts related. also kept a daily record of the work carried out in class. "It was a lot of fun for us and our parents." "I loved this project. It’s a beautiful project. We had a lot of fun!" "I love the ArtsSmarts project because it’s fun, we can make different things with art like plasticine, paint, and we can write in a journal." "It was really hard, but it was really fun. When we heard that we were going to do the art project, I was so excited, and the journal was really fun." "What an extraordinary opportunity for self-realization and class growth." "This project was very well organized . My child experienced a side of herself that she may not have if not for this project. She felt very proud at the show. Well done!" "We loved the ArtsSmarts project. My child talked to us a lot about this and explained all that was involved. We were pleased to be involved and enjoyed seeing what the children did. We feel this is something every child should get to do. For one as a learning tool, but also so they can show what they can do, the were all so proud." "I feel that the art project should be experienced by every child, also the child/teacher/parent interaction was enjoyable and very worth while. It gave my child a chance to express herself and talent in a different way which was through her art. I think it was a very interesting and worth-while project." "I think this was a great project. The children seemed very excited to show their artwork and show parents during the demonstration. Great job!"